MPs have this week debated the idea of introducing extra public holidays to mark the religious festivals of other faiths as well as the Christian ones for Christmas, Easter and Whitsun. Over 50,000 people have signed petitions calling for extra days off for Muslim and Hindu celebrations. Despite being the second largest UK religion, Muslims do not get a lawful public holiday on religious occasions such as Eid; nor do Hindus, the third largest religion, have a day off for Diwali. 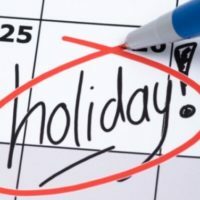 Apparently this idea is very unlikely to succeed as the Government has no plans to create new public holidays, the cost of which to the economy is significant; some estimate that the day off for the Diamond Jubilee in 2012 cost employers around £1.2 billion. They do, however, encourage employers to respond flexibly and sympathetically to any requests for leave, including those for religious holidays. As Christians, we are grateful for the Christian legacy in our country which has influenced the timing of some of our public holidays and we would not wish for these to be abolished. But we also recognise and respect the fact that other religions have their own festival days and as Christian employers or colleagues we would want to be sensitive to the cultural and family needs of people in our workplaces. The fact that this debate is happening is another sign that our Christian heritage is increasingly seen as on a par with that of other religions; the substance of the recent debate was much more about economics and practicalities than whether retaining holidays relating to Christian festivals is a statement of the kind of country we want to be. So while we are glad that our national calendar reflects our Christian heritage, we must be realistic that we are not a predominantly Christian country; over time the understanding of, and participation in, any of these festivals is diminishing and these holidays are mainly seen as an opportunity for leisure and family.